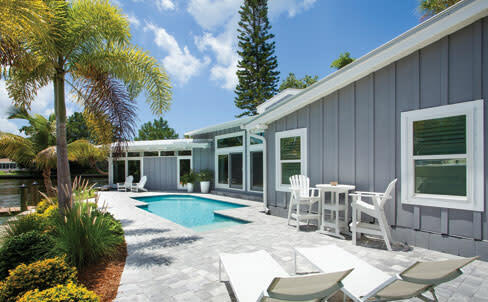 A Siesta Key cottage with an artistic pedigree goes from tear-down to terrific. It was a family tradition. 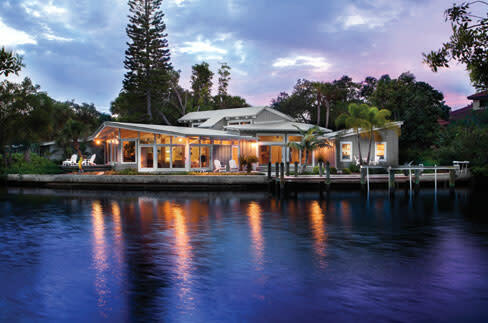 For years, Kristin and Jimmy Raybon would pile their three children into their motorboat on the weekend and meander down Siesta Key's scenic Grand Canal until they reached an old mud-brown clapboard house with floor-to-ceiling windows on a wide curve of the waterway. There, they'd wave at the tall woman with the graying ponytail who'd be painting on an easel set up at the water's edge, a German shepherd lazing at her feet. The woman was Nike Parton, a 1954 Ringling College of Art and Design graduate and award-winning plein air painter who created vivid images of the Florida outdoors—fishing boats, palm groves, blood-orange royal poinciana trees—no doubt inspired by her home's setting on 130 feet of Grand Canal opposite a park-like piece of county-owned undeveloped land. Parton taught art classes in a separate high-ceilinged studio on the property. "We called it the Glass House," says Kristin, "and we always said that we wanted to live there someday." That dream came true in 2009 when Parton's estate put the house on the market. It had been occupied by renters who'd made a mess of it. Despite its dilapidated state—"it was awful, very rustic and dark, dark inside," with deep brown paneled walls and ceilings everywhere, Jimmy remembers—he jumped on it when he saw the MLS listing. Razing the house and starting over would have been cheaper, he says, but two things saved it. It's set at ground level just seven feet from the seawall, so that views from the big glass windows make it feel like you're floating on a boat. ("You couldn't build anything like it today [because of new elevation requirements]," Kristin says.) And it's a sentimental part of their family history. "For so many years we saw Nike painting here," says Jimmy. "It didn't feel right to tear it down." It didn't hurt, also, that Kristin is an interior designer who specializes in updating aging Siesta Key condominiums. "My sister fell over laughing when she saw the 'before' pictures," she says. 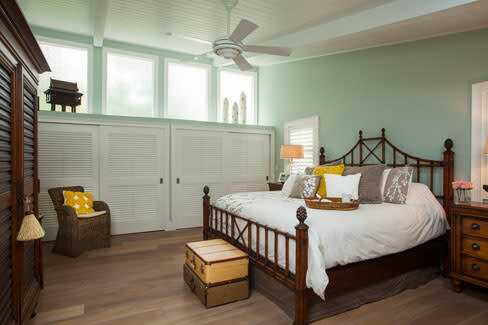 "I had to look past all that to find the coastal charm. You had to have a lot of vision, but you could absolutely see it." Instead of leveling, the Raybons lightened up: covering the dark tongue-in-groove ceilings and walls with bright white paint, installing white-oiled European oak floors in eight-inch planks that evoke the feeling of being on a boardwalk, and adding additional floor-to-ceiling windows on the canal side where they've nestled a dining table. Now, says Jimmy, "When you sit at the table, it's like being in an aquarium. Schools of manatee and sting rays come up; a nest of ospreys just had babies and they swoop down in front of us." In the adjacent open kitchen, they replaced the small bank of '50s-era cabinets with white cabinets, white quartz countertops and a sleek Carrara marble-topped island. 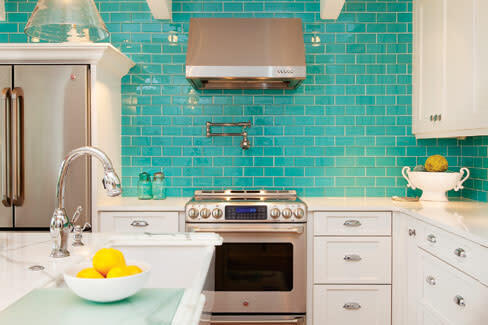 The new aqua glass backsplash references the water view, and a vintage brass light fixture over the dining table sets a nautical tone. Kristin found the metal seahorse hanging from an upper beam at the Sarasota Trading Company. "It feels happy," she says. 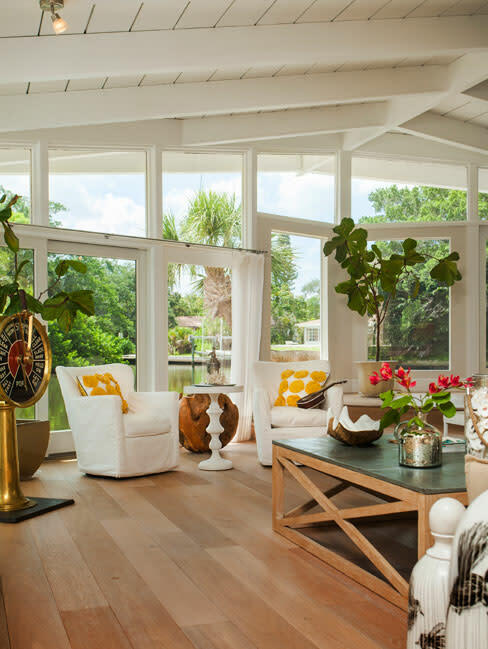 Their biggest construction project was transforming the original art studio into a master suite and connecting it to the main house with a brand-new, light, white 550-square-foot entry foyer, where once stood an overgrown jungle of tropical plants. 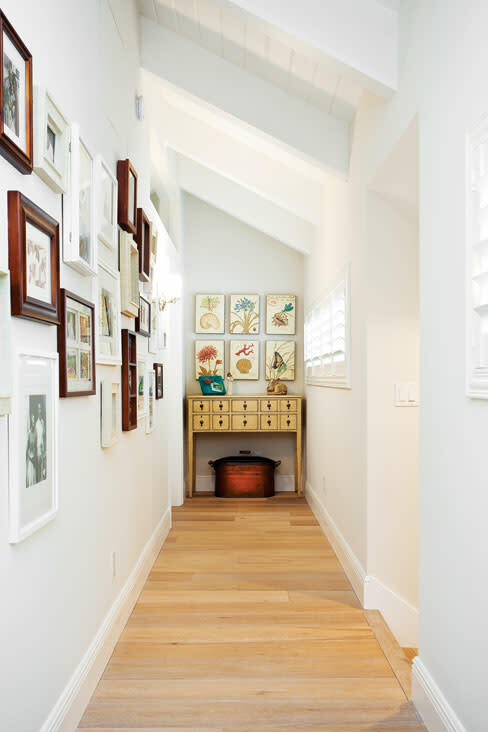 On the foyer walls are striking, large-scale original survey maps of St. Armands Circle from 1926, gifts from Kristin's father, who was the former owner of Hemingway's restaurant on St. Armands. The Raybons are quick to credit contractor Eric Hockett for sharing their vision. "It was a tear-down until I met Eric; he saw the vision, too," Kristin says. The entire project took two years. "We kept the original contemporary bones with its cottage charm but gave it a modern spin that fits our family and lifestyle," says Kristin. "It was a lot of work, but in the end I believe Parton and Oxley would be proud."